Sept. 23, 2016 - They're charismatic and cute, but the tree frogs that live in Cusuco National Park in Honduras are being decimated by chytrid fungus. 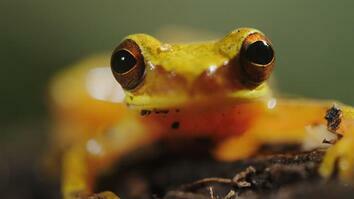 The fungus has spread worldwide, causing hundreds of amphibian species to become endangered or even extinct. Biologist and National Geographic explorer Jonathan Kolby has set up HARCC, the Honduras Amphibian Rescue and Conservation Center, to study and treat these frogs. Some of the species are found nowhere else on Earth. 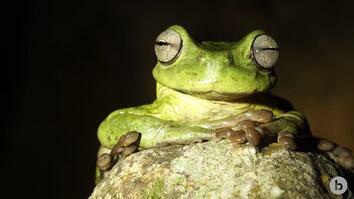 Read more about the conservation effort to save the endemic tree frogs of Cusuco National Park. I think its unfortunate that the first major wildlife disease outbreak around the world is affecting frogs, because a lot of people don’t perceive frogs as charismatic and cute and important. But frogs have amazing personalities themselves, they are just as important in the environment as these large animals as well, and they’re beautiful. Cusuco National Park is a montane cloud forest in northwestern Honduras. There is an amazing wealth of biodiversity and especially for the reptiles and amphibians. It was recently assessed as in the top 25 sites in the world for its unique and imperiled amphibian diversity. My name is Macrin Ramírez. I am 82 years old, and I live here in the national park [Cusuco]. Many types of frogs have gone away. Their numbers are smaller; fewer of them are calling. 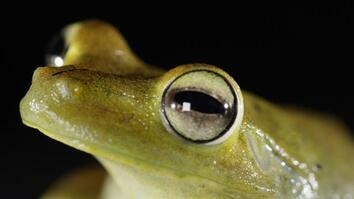 The offspring of frogs are not around anymore, and now they’re not the same. Yes, we need to save them because quickly they can disappear. So amphibian chytrid fungus is an aquatic fungal pathogen, it’s one of the first wildlife diseases that has truly gone global by the time we knew it existed. It’s leading to one of the largest mass extinctions that we have ever documented. I’ve been working alongside Jonathan Kolby since 2010 here in Cusuco National Park. Through the research that we’ve been doing, we came to understand that chytrid was greatly affecting a lot of the populations of frogs here, and specifically some of the endemic species. Frogs play a really important role in the food chain, so they support many organisms. Particularly there’s one snake species here that’s an amphibian specialists, so it preys almost exclusively on amphibians, and its thought to have population declines itself, which is almost as a direct result of amphibian populations crashing. As a tadpole metamorphoses into a frog its immune system suppresses, because the tadpole begins to develop totally new organ systems, that of an adult animal. The stage of metamorphosis is most often when they succumb to disease from chytrid. We have now established the Honduras Amphibian Rescue and Conservation Center, which means removing the younger, weaker animals before they die from chytrid, curing them, raising them until they’re stronger healthy adults, and then reintroducing them. What happens with a lot of rescue efforts is, you take populations from the wild, you get them in captivity and then reintroduction doesn’t always happen. So the plan for HARCC I think is unique. I think HARCC is a fantastic initiative, especially for the conservation of these really special species in the park. They’re a pleasure to see in their natural environment and I would love it if in future years I can see their populations increase as a direct result of it.